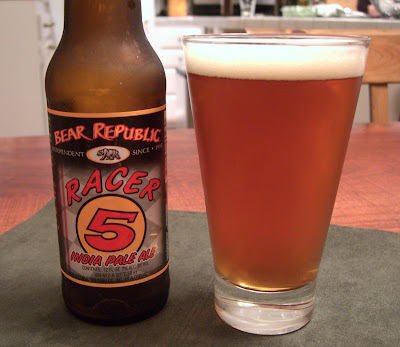 Racer 5 might just be the perfect IPA. 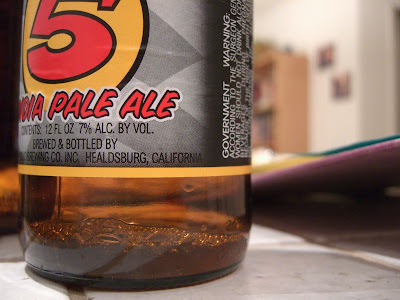 It was the first full-on west-coast style IPA we ever tried, and it was a revelation. They used to have it on tap regularly at the Liars' Club when we first started going there, and it quickly became our go-to beer of choice. At 7% ABV, it is right at the alcohol level I like. It is light bodied and refreshing, and has a hint of sweetness to balance the bitterness from the hops. If you get a chance, definitely visit the brewery in downtown Healdsburg. We stopped in on our recent beer tasting road trip, and really liked it there. I have flirted with other favorites over the years - Russian River Pliny the Elder, Alpine Duet, Ballast Point Sculpin - but I've come back full circle to where I started. Racer 5. 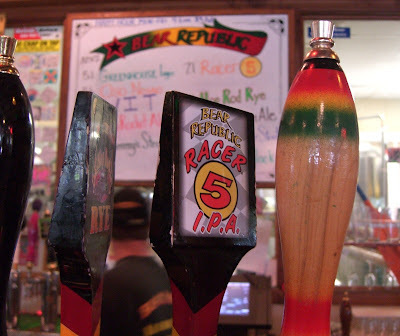 The place right around the corner from me (the Park Pub, on Phinney in Seattle) now has Racer 5 on tap! Nice! We can get it pretty easily here in bombers, and just recently in six packs. It is pretty hard to find on tap, though.